Linda Marie Peterson was born March 29, 1961. She received her education in Maple Ridge and married Mark Daigle on April 12, 1980. They live in Port Coquitlam, Be. They have two children: Aimee and Matthew. Aimee Kathleen Daigle was born March 23, 1983 in Vancouver. She is currently in grade eleven, works part-time and enjoys field hockey, roller hockey and skiing. Matthew Thomas Daigle was born May 5, 1985 in Vancouver. He is currently in grade nine and enjoys wrestling, road hockey and skiing. He is also very active in Sea Cadets. Esther (Peterson) Wickberg lived in Winnipeg until her death on January 8, 1989. Her grandchildren Carla, Douglas, Diane, and Donald live in California with their families. Ida (Peterson) Miller and her husband, Dave Miller, lived in Los Angeles. Her husband, Dave, died on June 21,1989. Ida later moved to Tigard, Oregon to be closer to her son, Allan, his wife, Doreen, and sons, Mark and David. Her daughter, Margaret, lives nearby in Lincoln City, Oregon. On September 19, 1995, Ida passed away at the age of 94. Albert Peterson and his wife Lillie (Larson) farmed in the Hilltop District and retired to Brandon, MB. Albert died December 12, 1982,and Lillie died on December 1, 1989 at the Fairview Home, Brandon, MB. Albert and Lillie had three children: Agnes, Dennis and Norman. Donna (Mitchell) Yanke, her husband, Rob, and son, Derek of Ashern, MB; Brent, his wife, Cheryl, and sons Brendan and Michael of Stonewall, MB; Shelley Mitchell and son, Tyler, of Winnipeg, MB; Scott, his wife, Shelly, and daughters, Hayley and Erika, of Winnipeg, MB. Dennis Peterson and wife Debbie reside in Duncan, Be. They have four daughters: Sherrie of Belize; Alana of Alexander, MB; Angela and Sian of Duncan, Be. Norman Peterson and wife, Pat, reside at Long Bow, ON. They have three children. Their daughter, Adele, of Oakbank, MB; son, Peter, in Calgary, AB; son, Paul, in Winnipeg, MB. Edwin Peterson and his wife Amy (Walstrom) lived in the Hilltop District all their life. Edwin passed away on March 6, 1982. Amy lived on at their home with their son, Clarence. Amy moved to Parkland Home in December of 1998. At the time of her death on November 14, 1999, Amy was living with her granddaughter, Dawn Goddard, and family. Edwin and Amy had four children, LaVerne, Elenor, Carolyn and Clarence. 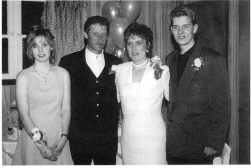 Elenor (Peterson) LeBeau and her husband Andy were married onAugust 13,1994. They reside in Winnipeg, MB. Elenor has four daughters. Dawn and son, Devon, reside in the Erickson District. Shannon, (Mike) and children, Ashley and Trevor, live in Sherwood Park, AB. Kelly (Gerald) and their children, Joao and Stephanie, live in Winnipeg, MB. Lesli (Bob) and son, Michael, live in Gibbons, AB. Elenor's step-daugh­ ter, Michelle (Everett), and family live in Swan River, MB, step-son, Brett LeBeau (Brenda), and family live in Transcona, MB. Carolyn (Peterson) Vogt still resides in Winnipeg, MB. Carolyn was widowed when her husband, Wayne Vogt, died on December 27, 1990. Her son, Daniel, is now living in Campbell River, BC and is engaged to Jennifer Side. On March 2, 1996 Carolyn was married to Glenn Peckover. Clarence Peterson has taken ownership of the family farm and continues to live in the Hilltop Community. Elsie (Peterson) Hibner lived in White Rock, BC until her death on September 21, 1990. Elsie's daughter, Beryl Larsson, lives in Winnipeg, MB. Beryl's husband, Peter Larsson, died on January 27, 1995. Their son, Walle (Virginia) and children, Zion and Eric, live in Winnipeg and their daughter, Kimberly (Richard Enright), son, Jonathon, and daughter, Carly, have moved back to Winnipeg from Abbottsford, BC. Eleanor (Peterson) Gordon is still living in her own home at the age of 89 (Febrnary 8, 1911) in Edmonton, AB. Her husband, Stewart, died on August 31, 1989. They have one daughter. Grace (Gordon) Crnickshank lives in Edmonton, AB. Her husband, Gordon, died on December 7, 1988. They have three children: Diane (Crnickshank) McHutchion, children Lindsay and Ben; Allan Crnickshank; Mary Wynne (Crnickshank) Emchuk, husband, Jon, children, Anika and India. They all reside in Edmonton, AB.